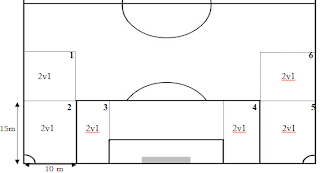 European Coaching Corner: 9- How to organize a session of teaching/practice? 9- How to organize a session of teaching/practice? The quality of conduct and orientation of the teaching/learning are closely linked to the quality of information to the teacher/coach is able to pass on the teaching of the game, well as the capacities we have to evoke in young players, the interest, the interest and passion for soccer. The teacher / coach assume a determinant model of the level of competencies that a young player will achieve in the future. So that we can confirm progress in the development of young players, are necessary that the teacher/coach to prepare careful and detailed the session of teaching/practice. Through the elaboration of the planning, the teacher/coach must anticipating the amount of an activity that want to accomplish. Becomes, imperative to prepare in advance the training session. avoiding improvisation and random, should register in a proper form, objectives, content and strategies to implement, following a line programmatic coherent according to the different stages of teaching soccer previously defined. Definition of objectives - Are fundamental determine very clearly what is to be achieved in the training session, because, the objectives will constitute the fundamental reference of all the activity to develop. For the process of teaching/learning can be effective, should striving for a maximum between 3,4 objectives for each training session and should be or even in accordance with the level of capacities of the players. 1* - An educational game, to develop the capacity of coordination, looking for start the session in a joyful and motivating way. 4* - Return to calm, relaxation, stretching the muscles, conversation with the team about the training session, collection and storage the material. 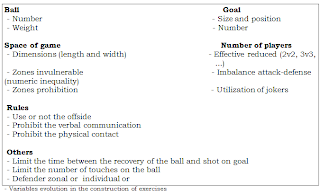 Selection of contents - There should be the concern of selecting the contents to be approached, carefully choosing the exercises, always having as reference the game so that they can effectively meet the objectives. Variable Evolution – are how we can modify the same exercise, alternating slightly the behavior of players, in order to achieve the same objective but with a different degree of difficulty (upper or lower). • Be careful in the choice of exercises, proposing situations from the simplest to the most complex (with an increasing level of difficulty). The motivation is the foundation of learning (so they could evolution), the proposed exercises to be submitted must be in accordance with their level of capacity, cause demotivate in the players (not happens the learning), the same applies to the activities too easy, causing lack of commitment on the part of them (do not allow evolution), impossibility the players moving to higher levels (acquisition of knowledge). • Working in blocks of subjects because are not possible to learn everything at once, is important to systematize the same subject of teaching during a certain period of time, to verify the acquisition of knowledge. We know that the replications have become indispensable in order to learn any ability or capacity and they immediately begin to lose if after the first experiment, there is not a repetition of the same. • For a particular skill or capacity can be consolidated, are fundamental their repetition, not so in one, but over several sessions of teaching, distributed by blocks of matter and over a certain period of time. As an example, we could exercise clear-up/unchecked, consecutively, over several sessions of teaching and for a period of a one month. • For the repetitions of a particular matter does not become discouraging for the players, are necessary that the teacher/coach makes use of progress variables of the exercises, so you can always keep the interest of players thus contributing to the players development. 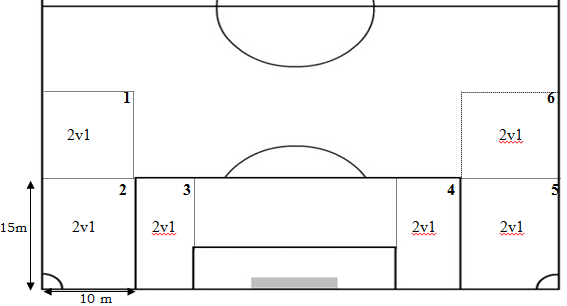 I will suggest some simple ways to distribute the players (18 players) for the space soccer field, taking advantage of the existing markings in soccer field of 11 with the regulatory measures, so to allow a quickly change and without wasting time from one exercise (Exercise 1) to another (Exercise 2) with no changes in the composition of the groups and spaces to occupy. After the construction of the plan the session of teaching, followed by its practical application, constitutes the active part of the process of teaching/learning. Is an extremely important moment for the teacher/coach, which is the operation of all their ideas about teaching soccer; how it is able to organize and lead a session of teaching, depend greatly the results obtained by the players. Presentation of Exercises - At the early ages, children are very active, having times of attention very short, reason why we should not ask for long periods of attention. Thus, in communications with children as well as the presentation of the exercises the teacher/coach should use simple language, concise and appropriate to their capacities, should focus only on the information considered essential to its execution. One aspect that contributes to greater effectiveness of teaching, are the way tasks are presented to the players. An apologist that whenever possible the verbal explanation must be involved in the demonstration of the exercise (even if it is necessary to repeat two or three times), before his execution by the players, so that when they pass their execution know perfectly what their tasks that have to perform. 1. Need to look to see. See to realize (understand the virtues and weaknesses of players). 2. 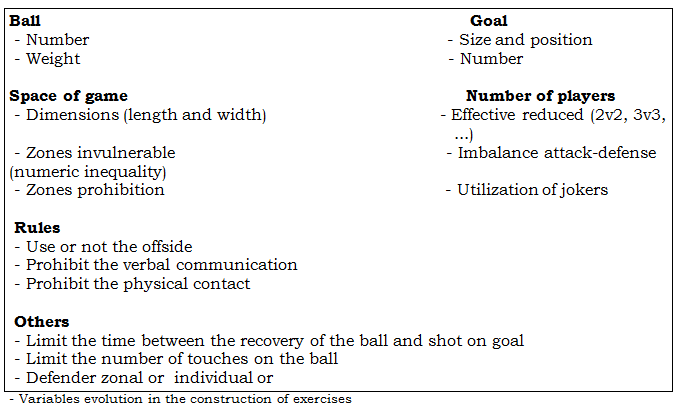 Frequent contacts with the ball (improve the capacity of players). 3. Frequent exercises of situations of finalization (The way that players can succeed and achieve many goals). • Being able to identify the causes who are in the origin of the mistakes of the players and know the necessary means to take to correct them. • Knowing the level of capacities the players, so that can modify possibly during the exercise the dimensions of the spaces, the goals, the number of players or the rules to be adopted according to fulfill their evolution. • Avoid to stay a long time during the execution in the same exercise (between 10 a 20 minutes), because exercises with a very long time, leads to a disinterest and demotivate from the players, with a consequent decrease in learning. Communication with players - The existence of a positive climate in teaching session, through a pleasant environment, motivating where prevails a good relation between the teacher/coach and players will surely contribute to greater effectiveness of the teaching/learning. The teacher/coach has a constant need to communicate with his players, either before, during or after the teaching session or competition, should use simple language, appropriate to the ages of the players, order to be a full understanding of all activities to be undertaken. As well as knowing present their ideas are important for the teacher/coach know hear the ideas of the players, they feel much more motivated. • When want to communicate with overall players, is placed so that it can be seen by all, without letting any of them be put behind you (on the your back). • The guideline of correction and/or strengthening given by the teacher/coach about the motor performance of the player - feedback pedagogical, is an element of great importance in learning of the players. • Players for be able to make rapid progress, need to know immediately the result of any of your moves, in a way positive or negative, as feedback of their learning. • To correct and/or strengthening of tasks to be performed by players, use predominantly feedback positive, in detriment of feedback negative, already known to strengthen verbal and/or a positive sign or a simple compliment, are fueled an enormous stimulus and a great progression of learning. Contrast, the negative feedback are a stimulus inhibitor and discouraging for the activities of players, the teacher/coach should be tolerant and patient for the mistakes and learning of their students, avoiding being hostile and punitive, as well as ridicule or reprimand in a aggressively way. These must constantly encourage the students, avoiding the tendency to only encourage and support the more able, putting aside the less able. Manage the teaching session - The effectiveness of teaching is very dependent on the way how the teacher/coach is able to organize and conduct a session of teaching and managing the space and time available in order to provide greater and better conditions for learning among practitioners. a motor commitment in a pleasant environment, are factors which contribute decisively to improving the effectiveness of teaching/learning. Valuation - To have a control the whole process of teaching/learning, the teacher/coach should use the utilization of means to every moment to know the results and how it proceeded at its intervention and the level of knowledge acquired by the players. The teacher / coach will then using during and after the session of teaching a set of means such as sheets of records, reports, analysis and reflections about the different elements that interfere with teaching/learning. Control the activities of players - The teacher/coach should establish in the beginning of each season, a set of operating rules and standards of conduct that provide a climate of order/discipline, allowed learning. To have a good control over the activities of the players, are necessary to have a good distribution of players in the space of game, provide them with dynamic tasks, appropriate to their level of ability and allow them to have very time of motor commitment (avoiding players to are long standing without performing any task). Only through proper placement in space of play, the teacher/coach every moment can observe all the players during the realization of its activities. All of these aspects referred, help to reduce the creation of inappropriate behavior, to control the activities of players, and have a better efficiency on the process of teaching/learning. 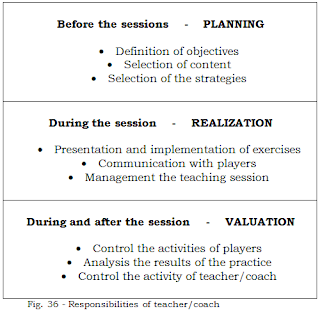 Controlling the activity of the teacher/coach - For the teacher/coach can evolution that are necessary throughout the various stages of the process of teaching (end of the training session, a final matter, the end of a game, end of season), reflecting and making a self-evaluation about the performance of his own activities with the players. Being the quality of teaching depends largely on the quality of its information that the teacher/coach is able to convey to their players, and because are an human being, are natural the teacher/coach during the teaching process also commit their mistakes. However, the biggest mistake is to ignore the errors, because the best are those who make mistakes less often: The error should not be an enemy of the teacher/coach, but one element that will help to correct their own mistakes. Improving the quality of intervention by the teacher/coach is an self-control of their activities, through adjustments to the procedures, the contents or the strategies to apply, so that you achieve the desired objectives in the process of teaching/learning. The session of teaching/practice plays a key role in the evolution of the players and the team game, is necessary (every time more) to believe in what they teach and what they practice, not believing in a maximum instituted throughout the ages in Soccer "bad practice good game", since the "training are the food of the game", so, who teaching/practice good will surely learn and play better. When it comes to preparing children and adolescents in the middle of soccer, the task of a coach is not restricted only to teach technical and tactical aspects. By working with human material in the middle stage of transformation, the coach must keep in mind, especially in times of recovery, which is dealing with children, who are not ready for any obstacles that will face. And to take better advantage of this moment in the life of young people, the soccer coach should explore mainly the motor development of their pupils. Therefore, it is necessary to know the living conditions of each one, the difficulties and the facilities that each of these children and adolescents face. One of the "arms" most important that a coach needs to have is patience. With clarity and simplicity, he should always remember that is the central role in the process of training of athletes. After all, it is rare outside the sport to identify a significant number of people who submit, voluntarily, the authority of another person. For these reasons, another natural function assumed by an experienced children and adolescents is an example, a thoughtless act of a coach in the face of these children can disrupt, and much, the development of each one. "In fact, they will remember what you did long after they forget what you said”, there are basically two approaches regarding the ability to influence people. The positive, which aims to strengthen desirable actions through motivation, and negative, which is to eliminate harmful behaviors through criticism and punishment. A simple reward, like a handshake, given after a positive action is essential in the learning process. After all, children need to know that mistakes happen. More than that cannot be afraid to act. They need to be encouraged always.